The source for the following is AAF Major Accident Report # 45-4-16-507. This report is available in PDF. The report is 14 pages and totals 737 k. Click here to view. These PDF files need to viewed with Acrobat Reader - if you don't have this program you can download it for free from Adobe.com by clicking here. 1st Lt John D. O'Reilly, his crew and one passenger while enroute from Kwajalein to Depot Tower; ultimately destination North Field, Guam was lost on 16 April 1945 at approximately 1400 Guam time. Weather was reported as Wind ESE, maximum of 8 mph; Sky coverage was 3/10 - 6/10 visibility was 12 mi. The last radio contact with the crew was at 1356. "Just after taking off Agana on a routine instrument flight, I observed a four-engine plane off the east coast of Guam. This plane was about six hundred (600) feet, paralleling the coastline, when first observed and was in a gentle glide. The plane was observed to continue its glide to the water. Upon impact with the water, the plane skipped once, exploded upon next impact and burning. We proceeded to the scene of the accident immediately. We spotted what we believed to be one survivor. The fact that there was one survivor was confirmed by an F6F pilot flying there. We dropped a raft upwind from the survivor. On the next time around, the raft was still closed. We made another pass and the raft was then open. I thought that I saw a man holding to the side of the raft. We dropped two smoke bombs to mark survivor's position and continued circling at one thousand (1000) feet. When Dumbo arrived at 1430, we departed. The crash occurred approxiamtely one thousand (1000) yards off shore. The wreckage drifted in toward shore. One open life raft was observed about 200 hundred yards south of the wreckage. The survivor was about fifty (50) feet south-east of the aircraft. Time of accident was approximately 1355. James A. Kane, Gunner's Mate 1/C 49th Seabees, also witnessed the accident, Approximately 13:56 16 April 1945 while on a project on Triangle Point, I noticed a B-29 flying low over the water headed directly into Pago Bay from approximately due east. My first reaction was that it was another plane just flying low - but wondered how a ship of that size would clear the terrain of the island. Aircraft contined to lose altitude and finally made contact with water without attempting to change altitude. Aircraft flight path was at 5 degree decent with top of water. Aircraft burst info flames upon impact. All but one one wing tip submerged within two or three minutes. It was hard to determine whether or not anyone was able to escape, from where I was viewing the accident. 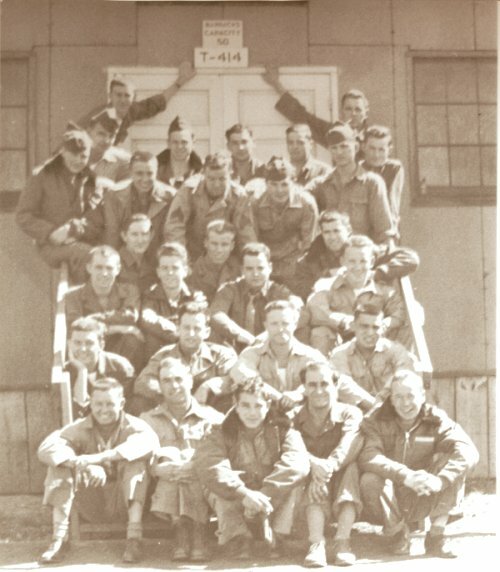 Below is a group photo of enlisted men from Crew 3, 5, 6, 10, 11 and 12 taken at Herington, Kansas 2 April 1945. *For the EM of Crew 11 - this was probably the last photo taken. Photo courtesy of Frank Saluta, nephew of Cpl Walter "Red" Rusin, RG.